I’ll start this post by saying that this an unusual spring here in Kentucky, so my beekeeping is a little off kilter. In more typical years, I put honey supers on in early to mid-April and do not see substantial nectar and honey storage until late April. This year, due to the mild winter and a spring that appeared to start in February, I put honey supers (with drawn comb) on in mid-March. That was a little early but, as you know, I was headed to the far side of the world on March 15th, and I knew the supers would be needed earlier than usual. When I returned in early April, these hives were overflowing with bees and were already storing large amounts of nectar. I promptly added every super I had onto the hives. By mid-April I had some supers full of honey and now have hives with two supers or more each, full and capped. Next week I’m pulling them and extracting honey. That gives you an idea of the nectar flow here, but the story I was leading up to is the swarming. I think that every hive I own has swarmed, at least once. I’ve caught some of them, and lost others. The good news is that my strong hives are still full of bees and capped brood, and are still making honey. But I need to watch all the hives for queens. I looked through some of them in the last few days and the story was the same in every one: queen cells, lots of them – a mixture of capped cells and cells from which queens have emerged. 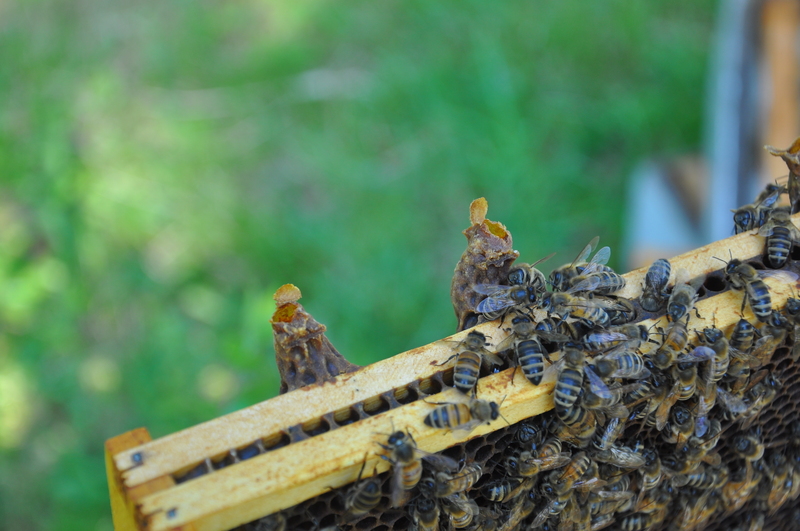 Capped queen cells from which queens have emerged. Note the little flaps of wax that look like opened ship’s hatches. This is where the queen ate her way out. I was not surprised. At this point I have stopped looking through them, both because I’m certain of what I’ll find, and because I don’t want to have to move the full supers of honey on the stronger hives. Never-the-less, I am concerned about the queens in these hives. Newer beekeepers might wonder why. Since there are queen cells present, they will produce new queens, right? My answer is they will, but that doesn’t guarantee that the hive will end up with a productive, laying queen. That is my concern. Bees in swarm mode will make numerous queen cells, as many as 10 to 30. However, after swarming is complete and the first virgin queens begin to emerge, numerous dangers threaten them. The first to emerge will try to kill the others in their cells by cutting small holes in the wax caps and stinging her rivals to death, or the workers will sometimes destroy the cells of the remaining queens and kill them. If more than one queen emerges at close to the same time, they will fight until only a single one remains. The result is that, though a hive may start with 20 mature queen cells, at the end, only one virgin queen survives to make mating flights. The hive’s future ultimately depends on the successful mating and return of a single queen. And this is not a sure thing. If virgin queens do end up in mortal combat, there is always the chance that the winner may be injured and unable to mate successfully. The mating flights themselves can be dangerous. The young queen may be eaten by a bird or lost in a sudden spring thunderstorm during her return flight to the hive. I receive many phone calls and emails in June and July from beekeepers with queenless hives. I am certain that most of these result from the unsuccessful re-queening of hives after swarming. Unfortunately, many beekeepers don’t discover the situation until the hives have been queenless for many weeks. By that time, their numbers may have declined to the point that they cannot be re-queened. That is why I check inside my hives during and after swarming season. I do not do thorough inspections, looking at every frame, but I do check for eggs or small larvae. Their presence or absence tells me whether or not the hive has a laying queen. This year I have put those inspections on hold for a couple of weeks, leaving the hives alone while I give the virgins time to mate and start laying eggs. How long does it take to go from capped queen cells to laying queens? When should I expect to start seeing eggs in these hives again? 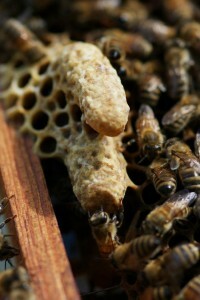 Queens emerge 7 to 8 days after the queen cells are capped. (And swarms will depart as soon as the that happens.) Another week will pass before the virgin queen is ready to make her mating flights. During that time, she reaches sexual maturity and makes orientation flights. After successfully mating, she will start laying eggs in 2 to 3 days. Added up, it takes 2 to 3 weeks for the new queen to start laying eggs after a hive swarms. I will resume my search for eggs in a couple of weeks, and it is an important search. Hi Phil, Alex here. I’m enjoying following your posts. I also have a hive (in it’s 2nd year) that has a lot of swarm cells. I think they already swarmed once. Our next door neighbor told my wife she did see a swarm in their pine tree last week. My wife was like, “why didn’t you call me? !” Oh well that’s the one that got away. I’m enjoying & benefitting from your posts, Phil. Many thanks for sharing your expertise. I have two hives which are 2 years old and 1 that is a year old. I have already had three swarms. Caught two of them. ALL hives have three honey supers. I am experiencing the same thing as with your hives. Thanks for the post you make. Get more info now than when you were at State. This is a question from a beginning beekeeper. You say the first queen to emerge will try to kill the others by “stinging her rivals to death”. My understanding was that the act of stinging resulted in the death of the bee because the stinger was attached to the intestine. How is the queen able to survive after stinging her rivals? Only workers die after stinging. They have a barbed stinger, like a fish hook – goes in, but can’t come back out – and tears away the bee’s abdomen when the bee pulls back. The stingers of the queen are not barbed. They can sting repeatedly and not die. Be aware that seeing lots of eggs isn’t necessarily a sign of a good queen. I got cocky with the early spring and decided– in late March — to set up a nuc with the queen from a super-strong colony, figuring there already were drones in that hive so there must be others available to mate with the new queen the colony would create. They made a beautiful-looking queen — a drone layer. Of course, I couldn’t determine that until all that presumed worker comb was capped over big fat drones. Had to kill the queen, rip out frame after frame of drone comb and let them start over with frames of eggs from another hive. We learn from our mistakes, and this was my colossal one for 2012! We can’t assume that a queen is quality or any good at all, whether the source is a queen cell or a purchased queen. Thank you for your wise and helpful posts Phil. I sure appreciate your insights and genorsity.